Radiation physicists, also known as medical physicists, are professionals who specialise in studying and ensuring safety and quality of radiation utilised for medical purposes. They have little patient contact but are essential in commissioning, credentialing and conducting regular quality assurance checks on the machines delivering radiation therapy to the patients. On occasion, they are involved in planning radiation therapy treatment to the patients. 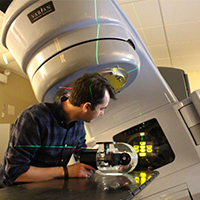 Radiation physicists oversee the accurate measure of the radiation output from radiation sources employed in cancer therapy. They are also commonly radiation safety officers, responsible for maintaining a safe working envionment for the rest of the staff working in the radiation therapy setting.